In the fall, there are lots of things to pick and pet and taste and carve, right? Last weekend had an air of harvest and it became clear that we’d better go out and do something pumpkin oriented STAT. Everyone else in the neighborhood had been feeling that way, too, so there were lots of recommendations for things to do on our neighborhood listserv, and I knew that we could go to Queens County Farm and do some country things without leaving the city. Like Brooklyn, Queens is vast and multidimensional. I’ve never lived there, though, so I find it confusing. Queens County Farm is in “Floral Park,” which is one of the parts of Queens that is snuggled up to Long Island, and is very residential and green. As we sought a parking spot, it began to seems like all 8 million of us were jonesing for pumpkins at exactly the same moment. Then I started to think about how Queens County Farm could not possibly grow so many pumpkins at this historical place which has nods to farming, but isn’t, after all, a giant industrial agriculture farm. I began to reason in the small yet active nihilistic part of my brain, that to serve the pumpkin needs of every New Yorker, they must truck them in. And what if instead of trucking them in from Long Island, they trucked them in from say, China? I needed to at least pretend that my pumpkin-to-be was local. Finally we just decided to go and see some animals first, since carrying a pumpkin around all day is not a good plan, anyhow. It seemed like the best thing to do that was to go to the farm next door — Green Meadows Farm — which was having tours. We showed up and talked with a woman who worked there. She was nice and informative and explained the tour that was available, but she seemed a little concerned. We soon connected her furrowed brow with her belief that we’d come to do a child-focused tour without a child. She just couldn’t see that our child was actually in a pack on his father’s back, quietly waiting to be shown splendid animals and hay. She was relieved when we pointed him out, and she sold us some tickets. With Claire, our aged and yet cheerful group leader, our motley group of children and parents of all different shapes and sizes and ethnicities strode off in the direction of a cow. The cow was chained in place, but it was healthy-looking and furry and we were allowed to milk it. Then we looked at baby cows, which are very cute and have fuzzy horns. Like young human offspring, they were mostly concerned about whether we had anything to hand them to eat. We did not, but in a situation like that, in a desperate bid to garner attention from the hungry animal, Henry will start grabbing things from the ground — usually grass — and attempt to use it as an enticement. When he did this to fields of sheep eating grass in England, I kept trying to speak for him, to entice the sheep over to where he was. “Look! This strand of grass is pre-picked! You may to walk over here to get it, as opposed to standing where you are to eat, but you don’t have to chew it out of the ground!” The baby cows didn’t fall for it, either. Then we saw pot-bellied pigs, and then real giant pigs along with their babies. Cornering animals to pet them is a very popular activity in our house, and the tour was going well because most of the animals were either handed to us or trapped in a small chamber where we could touch them. There was a pony ride. It was Henry’s first pony ride, and therefore to be relished. But to relish something, you need to realize that it is going to happen, and then you need time and space for it to happen, and then you need to be able to happily reflect, and you probably need to do it again. When it was Henry’s time to get onto the pony, he had barely even registered that he was on a pony before it was off and walking around the ring. The ring has a pretty small circumference, and as we arrived near to where we started, Henry was removed from the pony. I think we can all agree that going on a pony for 30 seconds and then being removed from it with no chance of going on another pony — which was our situation, since we were on a tour with different stations — is preferable to not going on a pony that you have seen — but it is more frustrating than never being presented with one in the first place. I felt like there was no way that he could have processed that experience. One highlight of the day was the hayride. The cars we rode in were pulled by a tractor, which was like a very brightly colored truck. Henry rode with his mouth open the entire time. Another highlight was a pen full of snow white chickens with blue faces. 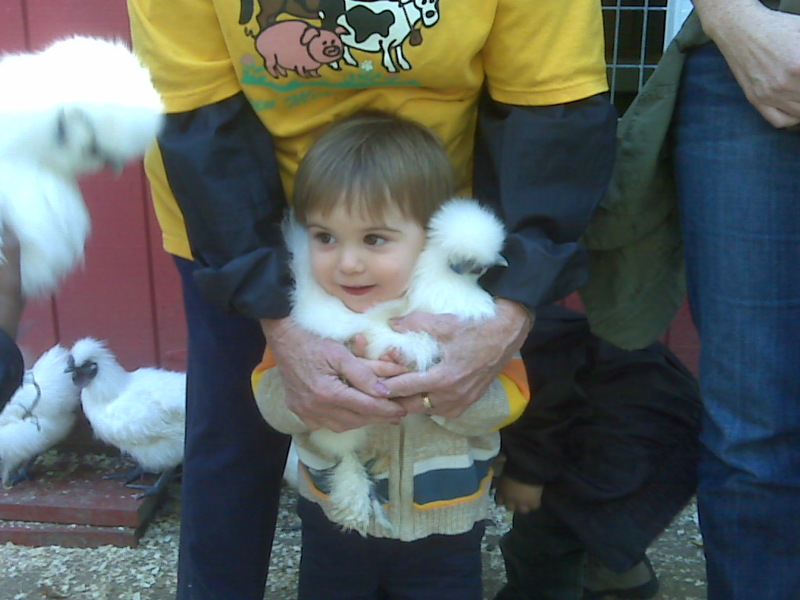 She showed us how to pick up the fluffy chickens very delicately, around the wings. She hugged one around Henry’s neck. I hugged one around my own neck, and if you can stop your brain from wondering when you will wash your neck, the experience is sublime. When we were done, we could each pick a pumpkin. Tell a small child to pick a pumpkin, and it will rush with great purpose to the edge of the pile, and pick the first mangy half-green misshapen one it comes to. It’s so charming, the ones which they pick. We brought home two. I hope we get around to carving them. Meanwhile, I leave you with this photo. ← Slow down. Eat. Unbutton. Make bones! I want a chicken scarf, too. I fear I won’t look as good in it, though, as your model.